Friday 29th September was not just a typical day here VP. We held our very own Macmillan Coffee morning at our offices in Nottingham in the true spirit of valuing people. During the event we had the VP Cake off where many of the office staff got involved and showed off their baking skills. All I can say is… Mary Berry eat your heart out! Our Director, Phil took on the role as ‘Cake Taster’ and judge. After much debate he decided that the winning cake was a Butternut squash, pine nut and honey cake. Awarding the ‘Best Baker’ badge of glory to Danielle North, one of our Community Care Coordinators. Alongside this we had a Tennis Challenge which bought out the competitive side of every one who came to visit. Including those that were reluctant to have a go in the first place. The aim of the game was to stand at one side of the room and try to get as many tennis balls into a bin at the other side of the room, without the ball bouncing!… trust me, it was a lot harder than you think! With a score of 4, the winner of this Tennis Challenge was our very own Finance Manager, Wayne Knight. 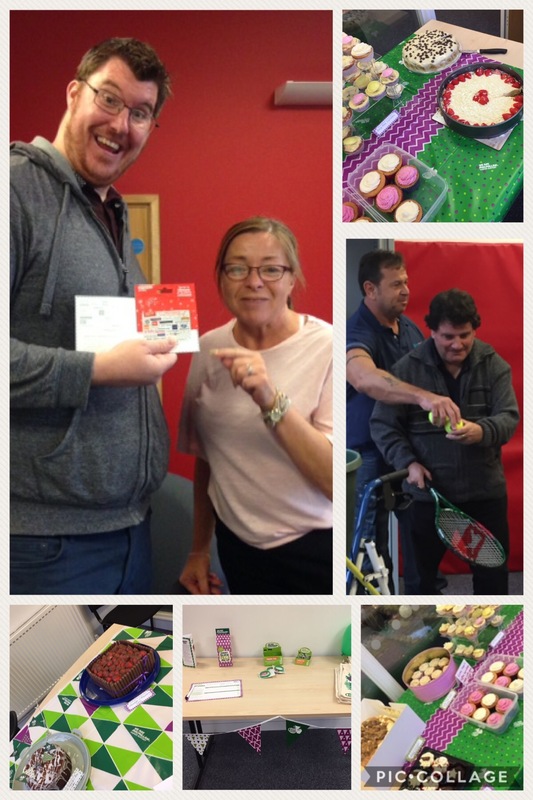 We also awarded a £50 voucher to one of our clients Sean for outstanding contribution to the day. Throughout the whole day Sean got involved and helped out with the Tennis challenge. Sean encouraged others to get involved and it is safe to say we would not have raised as much for charity without him. Well done Sean and many thanks from the VP Team. Throughout the day we managed to raise a fantastic £210.80 through all our donations. For all of those that came out and got involved, we would like to say a massive thank you!!!! It was wonderful to see our clients and staff get involved to raise some money for such an motivating cause. Our next charity event will be the Children in Need fundraising. Keep an eye out for what we have planned and we would love you to come in and join us.